The Team at Magical is always up for a challenge and in recent times the challenge of exciting teenagers with the outdoors has tested us. The stigma of the sector is sometimes associated with such phrases as 'we have nowhere to go, we are bored, playgrounds are for kids'. Well, we are different at Magical and dare to disagree. In recent years Magical has developed an array of equipment for the Secondary and Further Education Market. We have done this collaboratively alongside our business partners. These partnerships now allow us to create some of the most innovative and creative social areas, diverse zoning areas, and some really Magical technology. 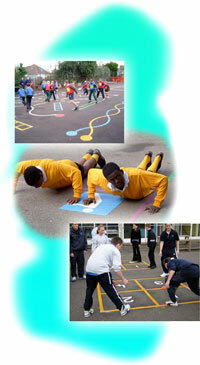 Our use of thermoplastic gives courts and pitches bright and highly durable playground markings. Take a look, we guarantee you will be surprised and call us if you want to set us challenge.